In 1999, moviegoers were thrilled by Brendan Fraser in The Mummy. In 2001 they were titillated by The Mummy Returns. A year later they kinda scratched their heads at The Scorpion King, but this year the filmmakers are off The Rock and things are back to normal with The Mummy: Tomb of the Dragon Emperor, and Sierra is busy developing the blockbuster game to go along with the blockbuster film. Developed by Eurocom Studios for the Wii, PS2, and Nintendo DS, the game will place payers in the roles of Rick O'Connell and his son Alex in their quest to defeat the servants of the Dragon Emperor, portrayed by Jet Li. The third-person action will consist of hand-to-hand combat, gun play, and platforming, and looks from the screenshots to be very much like Tomb Raider without the breasts, which is exactly what The Mummy franchise is all about! Look for the game on or around the movie release this August. MARLOW, UK (8th May, 2008) - Sierra Entertainment, a division of Vivendi Games, today announced the development of The Mummy™: Tomb of the Dragon Emperor, a video game based on one of Summer 2008's most highly anticipated movies from Universal Pictures. The game, which will mirror the fast-paced action and adventure depicted in the film, is being developed by Eurocom Studios for the Wii™ home video game console and PlayStation®2 computer entertainment system and by A2M for Nintendo DS™. The Mummy: Tomb of the Dragon Emperor game was created through a licensing agreement with Universal Pictures Digital Platforms Group. "Sierra Entertainment is pleased to partner with Universal to deliver an exciting extension to this popular film franchise," said Al Simone, senior vice president, Global Marketing, Sierra Entertainment. "Developed in collaboration with the film's creative talent, The Mummy: Tomb of the Dragon Emperor video game will add another opportunity for players to experience the thrill and excitement of this adventure favourite." "The Mummy is one of the most distinctive and expansive franchises in Universal's portfolio, and there is inherent gameplay in the property," said Bill Kispert, Vice President and General Manager, Interactive, Universal Pictures Digital Platforms Group. "The new film amps up the action, introduces a ruthless new villain and takes our heroes to incredible new locations. We are thrilled to bring all these attributes to life in this game." In the third-person action-adventure game The Mummy: Tomb of the Dragon Emperor, players will take on the roles of Rick O'Connell and his son, Alex (played by Brendan Fraser and Luke Ford, respectively, in the film). Gamers will follow the lead characters on their harrowing journey - across exotic locations from ancient Chinese catacombs to beautiful, but dangerous, Himalayan peaks - to defeat the revived servants of the Dragon Emperor (Jet Li). The Mummy: Tomb of the Dragon Emperor allows players to switch seamlessly between gunplay and hand-to-hand melee attacks, and also features a fast and fluid combat system and an arsenal of weaponry that can be used to vanquish the many bone-chilling enemies players will face during their journey. Fans of the upcoming Universal Pictures film, directed by Rob Cohen and set to hit cinemas this 1st August, will fight their way through The Mummy universe by utilising combat, puzzle-solving and hieroglyphic decoding gameplay elements. 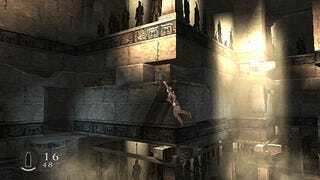 The Mummy: Tomb of the Dragon Emperor video game is expected to be available from UK retailers on 8th August, 2008. For more information, please visit the game's official Web site at www.mummyvideogame.com.